What an intense reality was the forsaking of Christ upon the cross! David said, "I have not seen the righteous forsaken" (Psalm 37:25), but what David never saw was seen on Calvary's bitter tree. Jesus had suffered terribly at the hands of men, unthinkable ignominy and shame had been heaped upon Him; all that was evil in men rose to incredible heights when Jesus was delivered into their hands. They mocked Him, scourged Him, spat in His face, and finally during His agony upon the cross they sat down and "watched Him there". In callousness and hatred they gloated over the sufferings of the Son of God. Yet all that He endured at the hands of men did not atone for sin. Had Jesus been other than the vessel of divine, unchangeable grace, He might well have turned aside from His mighty mission of love, but in His supreme devotedness He went on to bear the full weight of God's judgment against sin. When men had done their worst the darkness closed around Jesus, and for three hours, when that eastern sun should have been shining in midday splendour, the land was enshrouded in unnatural gloom, and in that darkness the vials of God's righteous wrath and judgment against sin were poured out upon Him. There was no clemency – no abating of the awful avalanche of wrath. It was poured out in full measure upon the sin-bearer. Had that wrath been poured out upon men it would have overwhelmed them in eternal perdition. 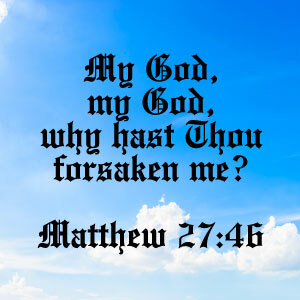 But more than all beside, Jesus was forsaken of God. Bearing that awful load! Alone! No eye to pity! No hand to save! In Gethsemane's agony of blood an angel appeared from heaven strengthening Him, but in the forsaking upon the cross there was no heavenly watcher to bear Him company. Great as were His earlier sufferings, they are infinitely exceeded at this moment. This marks the consummation of His grief. He is abandoned there, and the most bitter cry that ever rang through the universe issued from His lips, "My God, my God, why hast Thou forsaken Me?". Why? That those who believe on Him might never be forsaken. Thank God that the eternal salvation of the believer rests on the righteously accomplished work of Calvary! Jesus accepted and exhausted the judgment. The righteous claims of God were in no way diminished, for the claims of the throne are inexorable. The flaming sword of divine justice was wielded in all its terror against Jesus, and retribution in full measure was meted out for the sin and rebellion of man. That awful smiting fell upon the spotless Son of God, and every demand of the holy throne of God is fully satisfied. "It is finished" is the cry of a victor. He who was "delivered for our offences" has been "raised again for our justification". God is just and the "justifier of him which believeth in Jesus". He delights to justify freely. The God who withheld not His own Son can declare Himself in perfect love, and yet in absolute righteousness. "Mercy and truth are met together; righteousness and peace have kissed each other" (Psalm 85:10). What a sure foundation for the gospel of God concerning His Son! Well might the apostle Paul say that he was "not ashamed of the gospel". It is perfect in every detail from sure foundation to glorious topstone. Have you believed it? Can you say, "He was forsaken for me"?